I have had limited experience in this area, but have seen enough to report that currencies do indeed respond to transits to their birthcharts. From the few years that I've been doing this, there is definitely a correlation between the three currencies I've tracked so far, the Euro, Rand and the Dollar. However, one has to look at the progressed and solar-arc charts as well as transits to these charts to get the more complete picture. All I've been doing is monitoring the prices according to transits to their natal charts. Rand: February 14, 1961 (+- 10h00). Bad transits from slow-moving planets (as well as some progressions) correcly indicate the big drop in the Rand from 1998 to 2001, and its recovery in 2002/2003. It has been quite interesting these past few weeks watching the prices fluctuate, in real time, according to their transits. It seems to be so finely tuned that I've been able to say "down in the morning, up in the afternoon" and be accurate. This occurs when there is an exact bad aspect (by one of the faster moving planets or the moon) to a currency's birthchart in the morning, followed by an exact good aspect that same afternoon. You can use this software to monitor transits to any currency you choose (you'll need to look up the "birthdate" of the currency on the search engines). 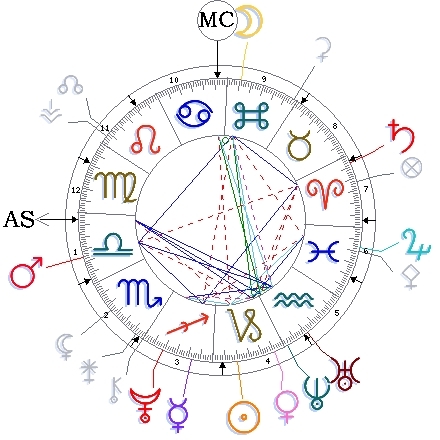 Note that "each currency has a birth chart very close to being the birth chart of the nation because normally, the currency and the nation are born just about at the same time. But the Euro is an exception to this rule since the 15 countries agreed to create the Euro at a specific time" (ref: MagiSociety). Once you have this, enter it into the program using an approximate place of birth (e.g. Japan) and a 10am birthtime, if you cannot find out what it was. Save the details and you will then be able to monitor transits to that currency. Just remember to select the "Full Transits" option. Please note that the Lucky Days program is unable at this stage to produce transit reports for currencies incepted before 1920. Click here to view live-account proof of the latest, most finely-tuned Forex trading robot available. It makes money for you while you sleep!